I just got back from a four day trip to New York, and as I felt myself being filled with art, music, and theater it occurred to me that I need more of the Arts in my life. Now, that may seem funny coming from a humanities teacher. I mean, I teach this stuff. Every semester. I can give students 101 reasons why art is important in their lives, but I am coming to see that teaching art is very different than experiencing art, and that in my own life, I need to experience art on a more regular basis. I live in a small town in a rural area. The artistic opportunities I have locally are limited. I have it better than many who live in rural areas because our local university offers plays, concerts, visiting artists and art exhibits every semester. And I often support these events. But I am also finding there is a significant difference in student events vs. professional events executed by those who are virtuosos of the craft. And frequently, the visiting artists sponsored by the University cater more to the students’ desire to have fun and be entertained than to truly edify and cause reflection. Of course that has a place and a value of its own, but it does not fulfill my needs to be edified by beautiful and challenging things. Other times, I just don’t have it in me to attend a more serious event but to have to put up with the poor manners of many college students. I love young adults, but honestly, a lot of them have not yet figured out how to live in the company of others. I also am a working mom of four children. I am really, really crazy busy. My days are filled with teaching, meeting with students and TAs, prepping for classes, grading (grading times one billion), church responsibilities, laundry, helping with homework, being a taxi service, paying bills, taking care of the dog, etc. Most days I am just trying to survive and still be coherent by the end of the day. I am chronically over-tired. Over-tired in me breeds apathy, and I notice that I start not caring about things as much. Then add to this the LONG eight-month winters, with short days and bitter cold, and then a spring full of more cold and wretched wind……let’s just say come April and May, when things “should” be getting nice (in my book), and when those expectations are dashed, it is difficult to remember the need I have for art and beauty. It is difficult to remember that for me, experiencing these things help me maintain spiritual sensitivity and happiness. While I was in New York, listening to Maria Schneider’s jazz orchestra at Birdland (yes, the legendary jazz club), and the next night, as I listened to Mozart’s requiem performed by the Pittsburgh Symphony orchestra in Carnegie Hall, I felt those empty parts of myself start to fill up. We spent the days museum hopping, taking notes, and discussing curriculum enhancements for class. In the evenings we squeezed in a ballet, jazz club, a play, a musical, and symphony concert. I started to remember that I love the arts, that I chose it for my career because I love it. I had a glimmer of understanding–I was feeling the sensations of happiness and a connectedness to my fellow man that had been far from me for the past several months. Apparently, participating in the arts is NOT just a nice thing to do with my time, or a simple past-time for the idealistic–it is a distinct need I have that I need to make sure is fulfilled in order for me to maintain balance and happiness in my life. Otherwise, my life has a tendency to get too weighted down by the mundane of everyday living. Take the time to read–every day if possible. I need to read books with literary significance. I have noticed that popular fiction does not cut it for me anymore. They are fun to read for diversion once in a while, but it does not fulfill my artistic need. Practice the piano. I have two degrees in music. I am ashamed to say I have gotten out of the habit of actually making music. When my kids were little they would all climb on me while I tried to practice. Rather than be mad at them constantly, I decided to let it go. And I never picked it back up again in any kind of serious way. I play all the time for church and such, but it has been a long time since I learned a Classical piece all the way and truly perfected it. Remember that I love to cook and make things that are not just delicious, but pretty too. Make sure I get OUTSIDE and enjoy nature. Our winters are wretched, but our summers are exquisite. But those long winters and the fact that our university (and thus my teaching schedule) runs year round make it difficult to remember to take the time and really enjoy it. Consider staying in my small house for LIFE so I can always have funds for travel. Travel can rejuvenate me and provide a bolus of the arts I need so I can make it to the next opportunity. Make a list of foreign and artsy movies for me to work through. Methodically listen to music. Not as background, but with a score if possible. And with headphones, to block distractions. I am not good with casual interactions with most music. Finally, acknowledge that for ME, experiences with the arts are not “frivolous.” They are necessary for balance, fulfillment, and happiness, and I need to give myself permission to devote my full attention to them on a regular basis. I would love to hear from you. What do you do to stay fulfilled? What activities bring you happiness? What helps you stay centered? What helps you filter out the “noise” and meaningless activities of modern life and focus on what really matters? What helps keep you spiritually sensitive? Now that I am in my 40s, I think I can confidently say that for me experiencing creativity–either my own or that of others–helps me in incalculable ways. 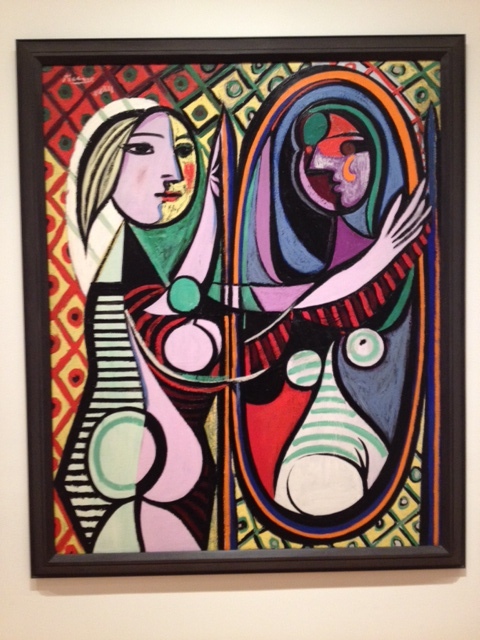 Like this young girl in this Picasso painting, apparently I was in need of some urgent self-reflection. (Picture taken at the MOMA a few days ago).